Paul De Bellis has played baseball since he was 6 years old. And he still plays -- Paul's a member of the Santa Barbara Titans (local) and Black Sox (travel ball), part of the 18 years and older Men's Adult Baseball League (MABL). He plays a few positions -- shortstop, third base, catches -- and even pictches. Throws right- swings right. 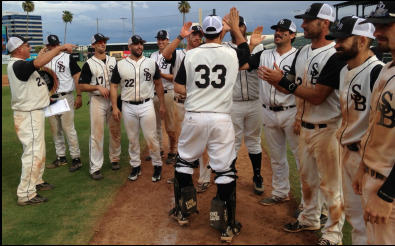 Paul's team plays in local and national tournaments, and in October 2015 his Santa Barbara Black Sox won the Phoenix World Champtionship Series of the Men's Adult League 25 years and up, a Phoenix, Arizona-based tournament organized by the National Adult Baseball Association (NABA). ​Paul partnered with NABA organizers who included a GloveLock sample in every team's welcome bag. "I use it and love it -- it's awesome, keeps my glove tight"
"I used it on my firstbase, catcher's and fielder's gloves ... The gloves felt secure. More so than with just the laces"
"Just what I needed for the thicker, leather thumb straps"
The GloveLock™ — Patent Pending © Copyright 2015–2017. All Rights Reserved.